The Golden State Warriors face a tough test on the road Wednesday night when they take on the Washington Wizards in Washington. Even without star guard John Wall, the Wizards have been playing some good basketball and are trying to hold on to a top four playoff spot as the season winds down. For the Warriors, they recently fell out of the top overall spot in the Western Conference to the Houston Rockets. Houston has reeled off twelve straight wins to take a slim lead over Golden State while the Warriors have won just six of their last ten games. However, on Saturday night in prime time, they put on a show against the Oklahoma Thunder and came away with a rousing 112-80 victory. The game featured another battle between ex-teammates Kevin Durant and Russell Westbrook and was a big one for the Warriors since the Thunder had defeated them in both prior games this season. The Wizards will play on Tuesday night in Milwaukee before returning home on Wednesday to face the Warriors. When Wall went out with his knee injury, a lot of people thought it might derail the teams playoff chances considering he would miss significant time. He ended getting surgery on the knee and the expectation was that he would be out anywhere from 6 to 8 weeks. The last game he played in was on January 25th at Oklahoma City and he has now missed 13 games. In the first 10 games after the injury, the Wizards went 8-2 including six road victories, including their most recent against the Cleveland Cavaliers this past Thursday. A pleasant surprise for Washington has been the play of backup guard Tomas Satoransky. The 26 year old from Prague, Czech Republic has held down the fort in Wall’s absence and solidified the point guard position. He is playing over 30 minutes per game since Wall’s injury and has scored in double-digits in seven games while averaging over 6 assists per game as well. And other players have stepped up for Washington in addition to Satoransky. Guard Bradley Beal has needed to step up his scoring and has done just that. He was also selected for his first All-Star game appearance. Forwards Otto Porter and Markieff Morris have been solid and Kelly Oubre Jr. has provided a spark whether starting or coming off the bench. For Golden State, these may be the dog days of a long season for the defending World Champions. They were everyone’s pick to get back to the Finals again this year and the odds are high that they will. Head Coach Steve Kerr even toyed with letting a few of his players run the huddle in a recent game and took a little heat for doing so. But he was trying to shake things up a bit to keep his team interested as the long season rolled on. But the Warriors have won 46 of their 60 games on the year and when playoff time rolls around, Kerr just wants them to be rested and focused and ready to go. And with the Rockets now a formidable opponent in the West, Golden State will need to be at the top of their game to move on to their 4th straight NBA Finals appearance. Barring an injury to one of their stars, the Warriors should at least get to the Western Conference Finals where they will probably go against the Rockets. 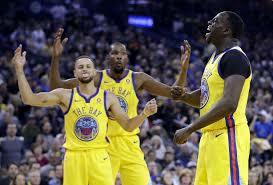 Stephen Curry, Kevin Durant, Draymond Green and Klay Thompson are battle-tested and should be at the top of their game going into the playoffs. But it could be their bench that determines if they’ll make it all the way again this year. The Wizards appear headed to the Eastern Conference playoffs and currently sit in the 4th position, although three teams are within 2 games of that spot. They have an opportunity to get as high as 3rd as they are right behind the Cavaliers. For the Warriors, it will be either a 1st or 2nd seed in the West for them as no other teams have a chance to catch either them or the Rockets. Washington obviously needs this game more than Golden State but they’ll need to go and get it against a good road team. The Warriors have a sparkling 24-7 record on the road so far this season. The game will begin at 8pm EST Wednesday night on ESPN.